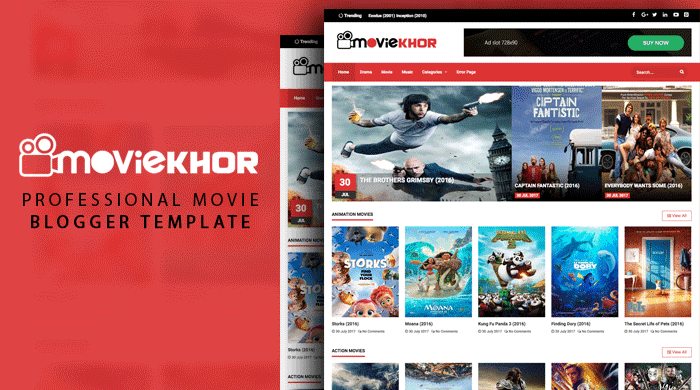 MovieKhor Movie Blogger Template. Hello guys, After a long time, Now we're sharing another blogger template. MovieKhor is the best and professional movie blogger template and it is perfect for all kind movie download or movie review blog. You know, TemplateMark shares all kind of best and free blogger templates. This is the another best movie download blogger template. MovieKhor is the high quality and SEO friendly and good looking movie blogger template. You can use this template on every movie review or movie download site that hosted on blogspot blog. TemplateMark is one of the best sources of download free and premium blogger templates. This time is for sharing another Free blogger themes for you. after buy this theme can i change the slider and footer ? Hello there. How can I reduce the size of publications at home? also how can I reduce the gap between publications? Hai sir may i know how to change slider in moviekhor template .Could you tell me.